It was a lazy, almost cloudless afternoon and we had just finished lunch near the port of Lazi town. 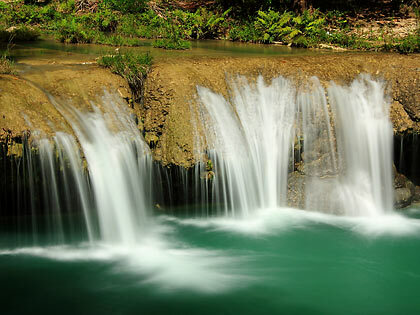 It was the last leg of our first day tour, a trip through the eastern towns of Siquijor. Our rented trike was grinding its way up the hills, away from the town poblacion, to our next destination. It wasn’t long before we stopped at a parking lot guarded by a shed and proceeded down a steep flight of stone steps and then we were there – looking at the lowest level of a multi-tiered cascade emptying into a turquoise-colored catch basin. The bottom tier of Cambugahay Falls. 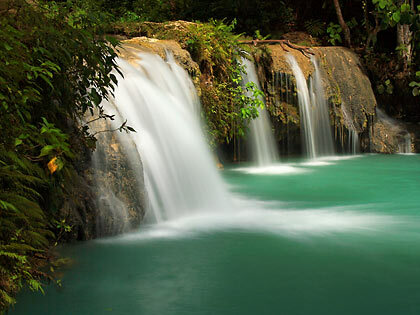 One of the most popular destinations in the island, Cambugahay Falls in Lazi town is proof that Siquijor is more than just beaches. It lies in a ravine so one has to descend a total of 135 steps from the road to get there. The falls has three major tiers or levels. Each one is relatively shallow in height but makes up in width what it lacks in height. All three tiers have turquoise-colored catch basins that invite the visitor to a refreshing swim. These waters come from natural springs further up the mountains or hills in the central part of the island and continue on down into Lazi Bay. vine hanging from one of the trees here to propel themselves into the water. The catch basin in the first tier is the deepest of the three and local children have made this their swimming pool. They were using a low-hanging vine from one of the trees as a swing to launch themselves into the water – like kid Tarzans and Janes. The two higher levels can easily be reached via a short ascent from the first tier. Plenty of trees provide a good shade here, so good that it made it difficult for Leo to take photos of the second level; there was just too much contrast between the shadows and light in the afternoon sun to get a proper exposure. The third level of falls in Cambugahay. Getting to Cambugahay is not difficult. It’s about 2 kilometers from the town center of Lazi on a paved road. There are road signs along the way and the entrance to the falls is right along the road. 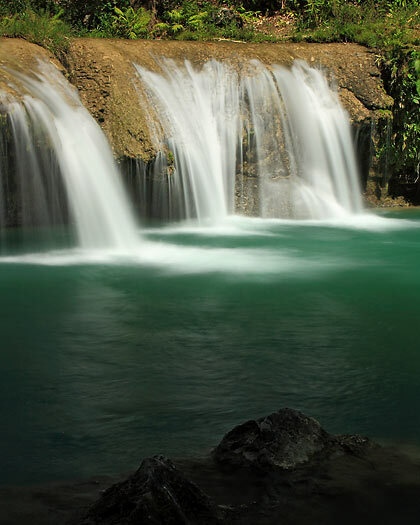 You can leave your vehicle at a parking lot on the side of the road (P20 for cars and trikes and P10 for motorbikes), walk across the road towards the entrance to the falls and descend 135 steps to the first level of Cambugahay. There are no entrance fees but we did leave a tip for a guy who helped Leo with his camera equipment. 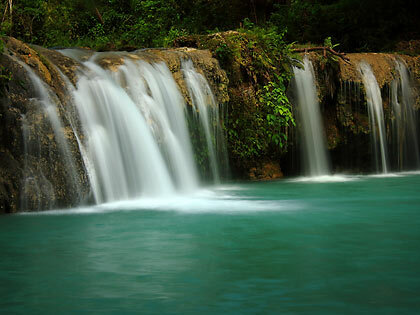 There are other waterfalls in Siquijor besides Cambugahay such as Lugnason Falls in San Juan and an unnamed waterfall in Maria. However these two are not as accessible as Cambugahay and the falls in Maria has rarely been visited. Before heading for Cambugahay Falls however, we spent some time touring the town center of Lazi. In the poblacion, the most famous landmarks are the San Isidro Labrador Parish Church and Convent. Both structures have been declared as national landmarks by the National Historical Institute back in the 1970s. The San Isidro Labrador Church in Lazi town proper. The San Isidro Labrador Parish church was completed in 1857 while the convent was finished about 30 years later. The façade of the church is built of coral stones and its walls are about a meter thick. 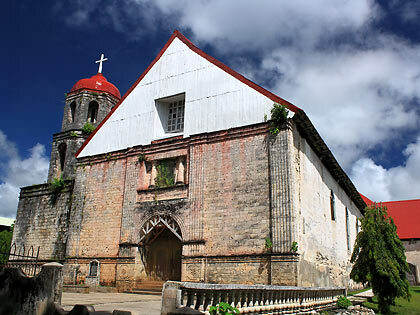 The church was left largely intact by the 2013 Bohol earthquake. 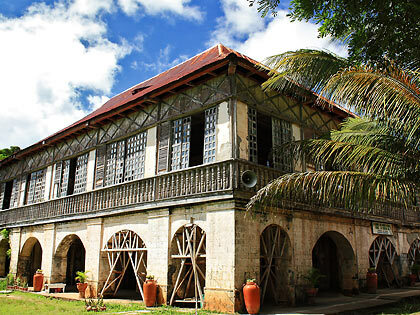 The San Isidro Labrador Convent, one of the oldest and biggest in Asia. Across the street from the church is the convent, originally built for rest and recreation of the friars. It is one of the oldest and biggest convents in the country and in Asia, with a surface area measuring 50 meters by 50 meters. Built of stone at the first level and wood at the second, the San Isidro Labrador convent is no longer being used for its original intended purpose. It now houses a school (in operation when we visited) as well as a museum. Most of the partitions for the convent had already been removed. Viewing the convent from outside, we could observe wooden braces in a few of the stone arches on the first floor, obviously being used as structural supports. These attractions are not all there is in Lazi. Beside the road going to San Juan and still inside Lazi is the 4 century-old balete tree, believed to be the oldest in Siquijor. Its age and the hundreds of vines and roots dangling from the tree give it an enchanted feel, adding to the island’s mystique. Lazi is located between the towns of San Juan and Maria with the town center lying on the southeastern side of the island. The town center is quite easy to reach via the paved national highway from either San Juan in the west or Maria from the east. 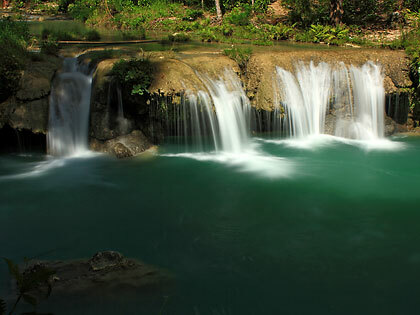 A paved road from Lazi town proper also cuts across the center of the island all the way to Guiwanon Spring Park near the boundary of Siquijor town and Larena so if you want a shorter ride to Lazi from either Siquijor or Larena town proper you may want to take this. As we mentioned in our other features in Siquijor, travel to any of the towns in the island is usually done by motorbike or by renting a tricycle.